Open Air Painters: Barbizon School, Impressionism, Pont-Aven, Newlyn School. En plein air or outdoor landscape painting began with the Romantics (fl.1789-1830) whose search for authenticity accorded particular value to spontaneous sketching from nature. Among the earliest pioneers of plein-air landscapes were Meindert Hobbema (1638-1709), John Constable (1776-1837) and Richard Parkes Bonington (1802-28), who with JWM Turner (1775-1851) exemplified English landscape painting of the 19th century. Although most of Constable's open air work was limited to drawings - in pencil and oils - which were later worked up in his studio, at least one of his works - his masterpiece, Boatbuilding Near Flatford Mill (1815) - was painted wholly out of doors. 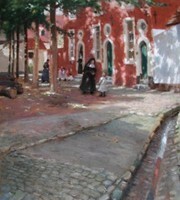 Famous schools of plein air painting include: the Barbizon School (1830-75); French Impressionism (1873-85); the Heidelberg School of Australian Impressionism (1886-1900); and the Russian Wanderers (Itinerants) (c.1865-1900). For an explanation of works by members of these schools, please see: Analysis of Modern Paintings (1800-2000). The tradition of painting landscapes en plein-air was greatly developed during the nineteenth century by a series of artist colonies in France, such as the Barbizon School, as well as others at Grez-sur-Loing, Pont-Aven, St. Malo, Louveciennes, and Concarneau. These colonies attracted Romantic naturalist painters like Theodore Rousseau (1812-67) and Jean-Baptiste-Camille Corot (1796-1875), more realist artists like Millet (1814-1875) and Charles Daubigny (1817-78), plus the more socially aware practitioners of French realist painting like Gustave Courbet (1819-1877). In addition, numerous Irish landscape artists travelled to France (especially to Pont-Aven) including the rural artist Augustus Nicholas Burke (1838-91), the romantic painter Frank O'Meara (1853-88), the Impressionists Walter Osborne (1859-1903) and John Lavery (1856-1941), the classical Dermod O'Brien (1865-1945), and Newlyn artists Stanhope Forbes (1857-1947) and Norman Garstin (1847-1926). Another strand of plein-air painting chiefly explored by French and English artists was Orientalist painting - typically of everyday scenes in North Africa. Newlyn School of landscape painting. The high point of plein-air art came with the emergence of Impressionism, the world famous art movement named after the picture Impression, Sunrise (1873) by Claude Monet (1840-1926). As well as Monet - who became famous for a wide range of outdoor works, notably his series of water-lilies - other leading exponents of Impressionist landscape painting included Pierre-Auguste Renoir (1841-1919), perhaps the greatest painter of 'dappled light' in the history of art, the Parisian-born Englishman Alfred Sisley (18391899), and the anarchist-inclined Camille Pissarro (1830-1903). 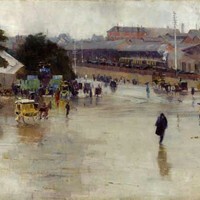 For more about their style of art, see: Characteristics of Impressionist Painting 1870-1910. - La Grenouillere (1869) by Monet. - Beach at Trouville (1870) by Monet. - Canal St Martin (1870) by Sisley. - Chemin de la Machine, Louveciennes (1873) by Sisley. - Poppy Field (Argenteuil) (1873) by Monet. - Dance at Le Moulin de la Galette (1876) by Renoir. - Gare Sainte-Lazare (1877, Musee d'Orsay) by Monet. 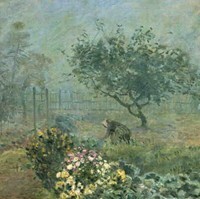 - Vegetable Garden with Trees in Blossom, Spring, Pontoise (1877) Pissarro. - Path Leading Through Tall Grass (1877) by Renoir. - The Red Roofs (1877) by Pissarro. 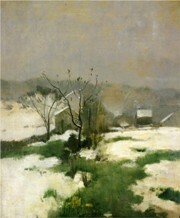 - Snow at Louveciennes (1878) by Sisley. - The Bridge at Maincy (1879) by Cezanne. - Mont Sainte-Victoire paintings (1882-1906) by Cezanne. - Water Lilies (Nymphéas) (1897-1926) by Monet. - Water Lily Pond: Green Harmony (1899) by Monet. Post-Impressionist artists Paul Cezanne (1839-1906) and Vincent Van Gogh (1853-1890) continued the tradition: Cezanne with his use of grid-like structures with which he slowly built up his compositions in his open air pursuit of French Classical painting traditions; Van Gogh in his manic, highly personal and rapid rendering of the landscape around Arles. One should also note that plein-air work was encouraged and facilitated not only by its freedom from studio rents, but also by the invention of the metal tube in which slow drying oil paint could be stored almost indefinitely. The "Glasgow Boys" - members of the Glasgow School of Painting (1880-1915) were the first Scottish painters to paint en plein air. They included: Robert Macaulay Stevenson (1854-1952), James Paterson (1854-1932), William York Macgregor (1855-1923), John Lavery (1856-1941), George Henry (1858-1943), James Guthrie (1859-1930), William Kennedy (1859-1918), Edward Arthur Walton (1860-1922), Joseph Crawhall (1861-1913), Alexander Roche (1861-1921), and Edward Atkinson Hornel (1864-1933). They were followed by the Scottish Colourists - Samuel John Peploe (1871-1935), Francis Campbell Boileau Cadell (1883-1937), John Duncan Fergusson (1874-1961), and George Leslie Hunter (1877-1931) - who were strongly influenced by Fauvism. For details of colour pigments, natural dyes and hues used in fresco, tempera, encaustic, oils and watercolours, see: Colour in Painting. Typically, painting a picture in the open air requires rapid composition and brushwork, neither of which is feasible unless the artist is familiar with the fundamentals of drawing. Thus it is no surprise to learn that many, if not most, outdoor painters were academically trained in life-drawing and other academic art subjects, such as linear perspective. Unfortunately, in today's colleges of fine art, this type of basic training is no longer seen as necessary - far less 'essential' - for would-be painters, who instead are encouraged to 'create' and 'express themselves' in a variety of media, without the need for methodical learning. While this focus on freedom of expression may facilitate variety and the development of new forms of artwork, it fails to inculcate the values and skills needed for outdoors painting. Because of this, more and more traditional artists are voicing their dissatisfaction with modern methods of teaching art, and with the reluctance of official arts bodies to promote the principles of painterly craftsmanship.  For more about plein-air landscape painting, see: Homepage.